Ooma is a name our granddaughter started using when she was just learning to speak. It was “Ooma, I love you” or “Ooma, can I have a cookie”. We’ll after that, it was a done deal. Of course, we all loved it and Lee has even used it in her bakery operation in Spencer, MA. Now that the bakery business is closed, we have decided to turn her avocation into a video series about baking – and what other choice for a name do we have than Ooma’s Cookie Jar. As far as our videos are concerned, we got our start doing shows for our local cable access center. We had two that Lee produced. One was a gardening show and the other was what she loved, cooking. 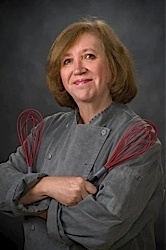 She was one of three cooks who appeared in the the 30 to 60 minute shows. The shows played on PEG channels in Central Massachusetts and, later on, were distributed more broadly throughout the US via a distribution system called PEG Media. We have embraced the Internet now. Our new show about pastries is done in smaller segments that we make individually available on Youtube. We will continue to make longer shows by combining the shorter one and will make them available for PEG stations as well. One last thing, it’s a pleasure doing these shows because, as members of the video crew, we get to taste test everything. Sweet! Ooma on set recording her show. The large white main-light reflector is actually the back of the Ooma’s Cookie Jar sign we used at our store in Spencer, MA.